What is this resource about? This resource provides an introduction to the ways in which instructors can design educational activities to address the interplay between emotion and learning. Read an Example, and learn more about Learner and Activity Variables, and Designing Your Activity. Emotion and learning are deeply, critically intertwined and the relationship between them affects academic performance. The relationship between emotion and learning is rarely part of the planning process when developing courses, nor is it made explicit within the activities themselves and throughout learning environments broadly speaking. Provide multiple means of engagement: Offer choice when possible and allow for students to select varying degrees of difficulty within an activity to find the right balance of demands and resources. Provide multiple means of action and expression: Support learners to cope with challenging activities by modeling specific learning strategies and providing mastery-oriented feedback. Provide multiple means of representation: Offer choice when possible and allow for students to select varying degrees of difficulty within an activity to find the right balance of demands and resources. This is something about providing multiple means of representation. Not all students enjoy working in a science lab. 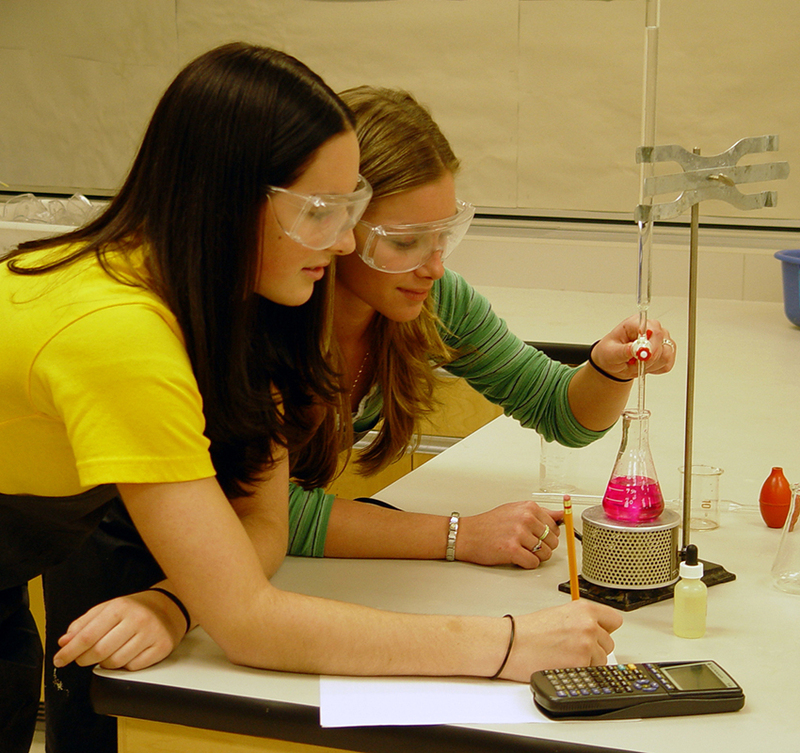 Two female students wearing protective eye wear viewing a beaker with pink fluid. One of the students is writing on a piece of paper and has a calculator on the table. As teachers, we strive to increase engagement among our students. For instance, when we think about fostering engagement in a lesson, often times we default to hands-on activities or movies and videos. For many students, lab activities for a science class can pique their interest, achieve ideal arousal levels, and sustain their attention. Yet for others, this activity can trigger emotions that impede engagement as anxiety and over-excitement can both ultimately inhibit learning. Additionally, there are many students who will fall in between these two extremes. As a teacher, it is critical to recognize and plan for the interaction between variable emotional responses and the activity itself. Each student will perceive a learning activity through his or her unique lens. Perception is influenced by a number of variables along a spectrum. On one end are the learner's personal experiences, preferences, disposition, temperament, and academic strengths and weaknesses. These variables reside within the learner and instructors are limited in terms of how much influence they have over these variables. 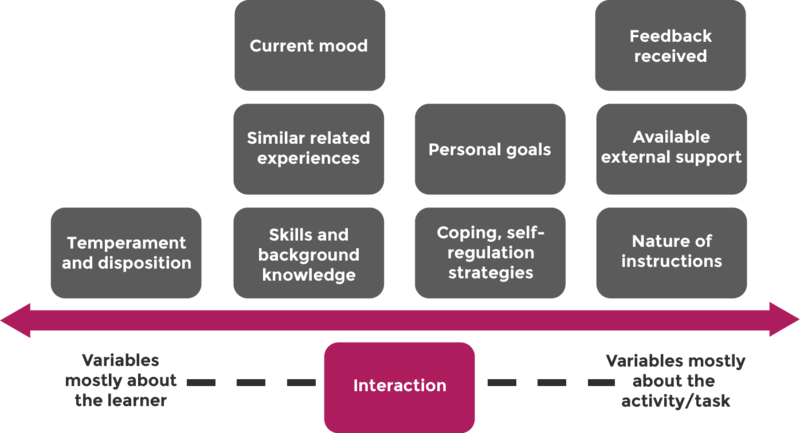 On the other side of the spectrum, there are variables within the activity or task itself that can be adjusted, which include the supports and strategies aimed to address both cognitive and emotional aspects of the experience. The graphic below shows the general spectrum of variables that a student brings with them into a learning experience (note that this is not a complete list of variables) and variables that the instructor can account for in the design. While there are two ends of the spectrum, the interaction between the learner and the learning activity will determine how these variables play a role. For example, while a learner may approach a math activity with some trepidation based on prior experiences and concern about inadequate skills, she may find that the activity was designed to provide enough support. What started as a negative perception fluidly moves to a more positive response that overcomes the prior negative experience. This diagram shows a spectrum of learner and activity variables. A double-headed arrow spreads across the diagram horizontally. Above the arrow, rounded rectangles are vertically stacked in groups. On the left side, the rectangles represent variables mostly about the learner, including temperament and disposition, current mood, similar related experiences, and skills and background knowledge. On the right side, the rectangles represent variables that are mostly about an activity or task, including personal goals, coping and self-regulation strategies, feedback received, available external support, and nature of instructions. Below the arrow is a rounded rectangle labeled “Interaction.” Dashed lines extend from the rectangle in either direction along the spectrum. Adjust the activity/task. Differences in affect and engagement exist not only between students but also within the same student over time as a result of development, context, and the act of learning itself. From the outset, plan for emotional variability and how it impacts interactions with content and tasks. Consider whether an activity assumes certain emotional skill sets or dispositions amongst learners, and design options so that the task remains invitational for students who may be struggling with those necessary skills. Support the learner to be able to cope with challenges within the activity or task. Learning is more than task completion. As teachers we strive to develop independent, self-directed learners. Through instruction, we can facilitate meta-cognitive strategies to help learners process information into meaningful knowledge and increase awareness of their own learning. The three principles of Universal Design for Learning (UDL) offer actionable steps for designing instruction that addresses the interaction of learner variables and activity variables. This principle focuses on the ways in which learners gather facts and categorize what they see, hear, and read (CAST, 2011). Addressing variability in perception encourages engagement and supports comprehension. Offer alternative forms of information such as diagrams, photographs, storyboards, and multimedia. For content presented in digital text, allow for tools such as text-to-speech to minimize cognitive demands on decoding, especially for students with dyslexia and English language learners. Introduce information progressively with temporary assisstive components or scaffolds to help students manage the content at a reasonable pace. Pre-teach critical information and emphasize relationships between concepts through multiple representations. Model ways to solve new problems with previously learned skills and guide generalization of student learning to new contexts by providing supported opportunities. This principle is connected to strategic actions, including planning and performing tasks, organizing and expressing ideas, writing essays, and solving math problems (CAST, 2011). Providing options for how students demonstrate comprehension helps sustain engagement and encourage persistence. Provide access to assistive technologies for expression. Adjust activity so that students can express their knowledge effectively and efficiently by including multiple tools for composition (e.g., written expression, voice recordings, multimedia). Support executive functioning by modeling goal-setting, selecting learning strategies, and monitoring progress. Use prompts to promote reflection about work and process. Guide students through sequences and prioritization. To monitor progress, embed frequent formative and low-stakes assessments to collect actionable information to guide instructional decision-making. Give specific targeted and timely feedback about strengths and weaknesses that encourage student persistence and suggests next steps. Make clear that assessment informs instruction, as well. This principle focuses on how learners can become engaged and stay motivated and whether they feel challenged, excited, and interested in what they are learning (CAST, 2011). Without engagement, learners will struggle to attend to content and make deep learning connections. Add choice in the selection of activities when possible. Offer scaffolded challenges that vary in degree of difficulty. Create learning communities that connect content to interdisciplinary topics and personal interests. Set the tone by making it clear that student emotional engagement and motivation matters. Embed self-checks in task and ask students to rate the difficulty of a task. Support relevance and persistence through tasks by making the purpose explicit. Offer clear expectations that support motivation. Emotion biases our attention, memories, and capacity for rational thought, and is thus a fundamental part of learning processes. As educators, the experiences we design for students must take into account the role emotional variability plays in behavior and academic performance within the same student over time and between students. The UDL principles provide actionable steps for educators to take as we approach course planning and student supports with this variability in mind. By capitalizing on the inclusive power of multiple means of representation, multiple means of action and expression, and multiple means of engagement, we create alternative pathways for achieving learning goals, while maintaining high expectations for our students. Watch CAST’s Director of Research, Samantha Daley, give a keynote address on emotion and learning. Affect is the experience of feeling or emotion.